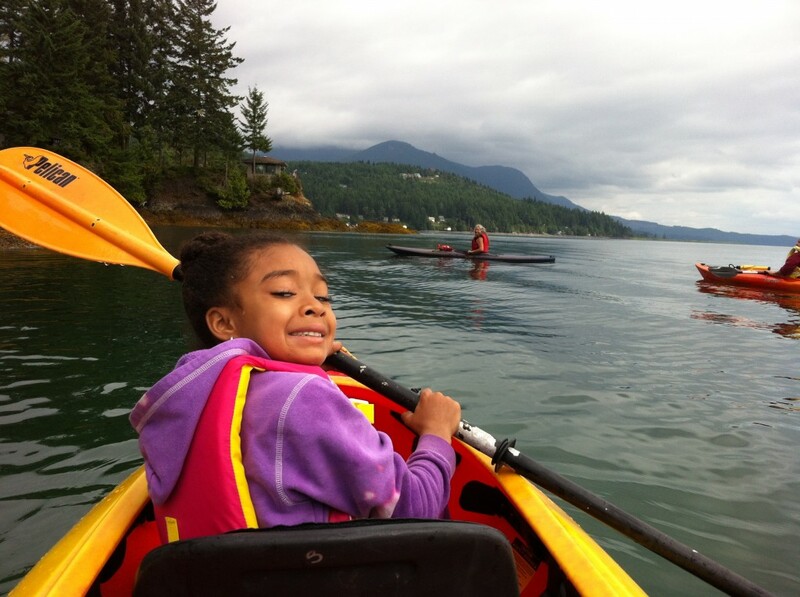 Hood Canal Adventures offers a variety of Biologist guided kayaking adventures on the Olympic Peninsula. Most tours are led by the owner, former Marine and Fisheries Biologist Christina Maloney. 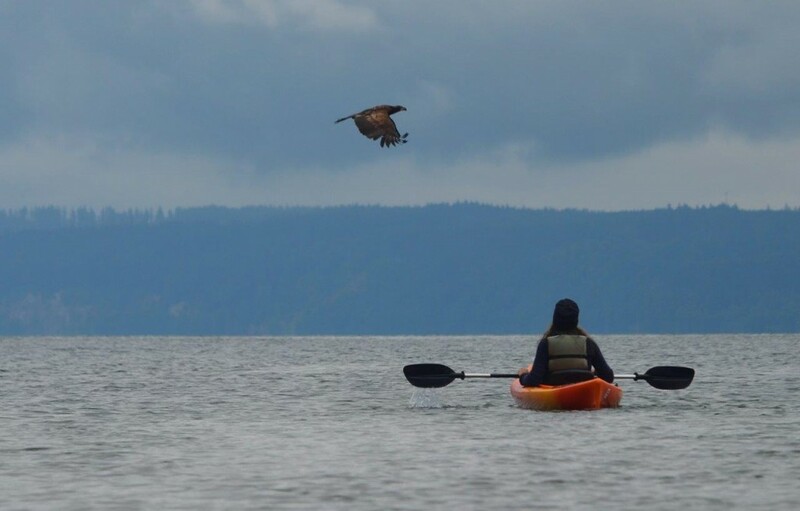 As you paddle along the shoreline of the Hood Canal you will learn about the wildlife and ecology of the Puget Sound. All tours offer the opportunity to learn about the area while viewing beautiful scenery, seals, eagles and other wildlife. Choose between our 1 hour Introductory Tour, 2 and 3 hour tours, and our full day River & Estuary Tour. In most cases you can pick your own date and time. Harvesting crab during the tour may also be arranged. Click on each tour title below for prices and details. 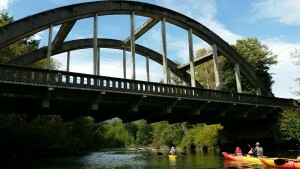 For larger groups, we also offer guided kayak camping trips. 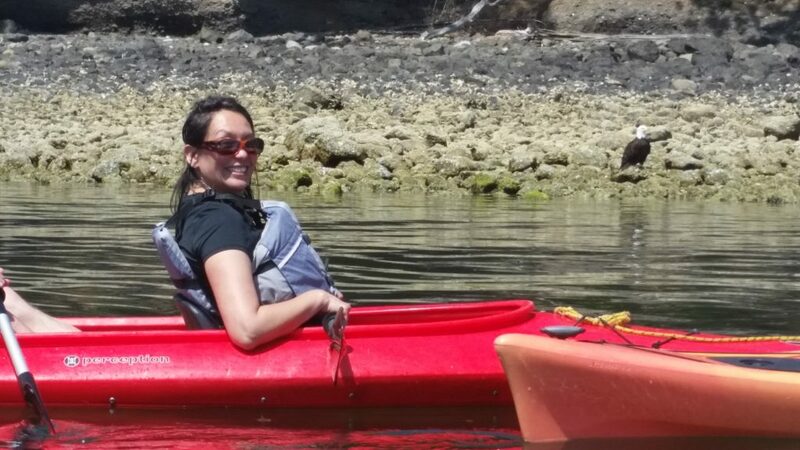 On our 1 hour Introduction Tour learn how to kayak or paddle board as you explore the shoreline of the Hood Canal viewing beautiful scenery and learning about the wildlife you encounter. You also have the opportunity to extend your trip by heading out on your own once you are comfortable paddling. Not a beginner but still want a short educational tour? This tour can be tailored for anyone. It is popular with families with small children and with folks who just want to relax for an hour. Bald Eagles are a common sight May through June, and on occasion we spot seals and porpoises so bring your camera! In May and June our daytime low tides uncover the bounty of the sea, and the sculpin spawning season serves up easy pickings for Bald Eagles. On this 2 hour tour we will view Bald Eagles from around the Puget Sound that flock to the shores of the Hood Canal. It is not uncommon to see 40 to 60 Bald Eagles on the beach and perched in overhanging trees, and some days we’ve seen over 100! Watch and learn about Bald Eagles with our Biologist and Naturalists and be sure to bring your camera for some rare up-close photos of eagles in their natural environment! This tour is conducted only in May and June when the area’s Bald Eagle population is greatest. Our Estuary Tour takes us out of Pleasant Harbor for a 2 hour paddle along the shores of the Hood Canal to the Dosewallips Estuary. There we will view a large colony of harbor seals, bald eagles, and other wildlife. Roosevelt Elk are often spotted munching on the salty grasses and a rare view of the Olympic Mountains is a treat on a clear day! Your guide will teach you about the wildlife we find and discuss the ecology of the Hood Canal and the estuary. If conditions are right we’ll paddle up river to explore the fresh water habitat of the Dosewallips River. In the late summer and fall we will watch salmon migrating upriver to spawn. On this 3 to 3.5 hour adventure you will learn about the Hood Canal with your Marine Biologist or Naturalist guide while we paddle from our location at Yelvik’s Beach to a secluded beach on Pulali Point. On this 6 mile round trip paddle we have the opportunity to view bald eagles, harbor seals, river otters, great blue herons, and once we saw a pod of orcas! Once we reach the beach we will enjoy lunch in the shade, shuck oysters, and take a swim in the warm waters of Hood Canal! The amount of bald eagles in this area during the Spring is astonishing and up close encounters are common. Our Biologist will guide you on this 4 hour tour that begins in a protected harbor, passing rocky coves and eagle perches before we stop for lunch, swimming and oyster shucking on the beach. After our lunch break we paddle to the Duckabush Estuary and up the Duckabush River at high tide. We do not provide lunches, so please BYO. Common wildlife to view on this tour includes harbor seals and bald eagles, and in the late summer and fall we’ll also see salmon migrating and spawning in the river. There is a 2 person minimum for this tour unless we have the opportunity to add you to another group. This tour requires planning with the tides so some scheduling flexibility is required. Please contact us to make your reservation. 48 hours notice is recommended to schedule a tour.